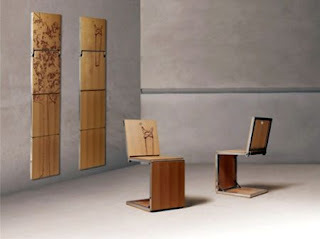 Dror Benshetrit has created the most amazing folding chair you and I are ever likely to see, called Pick. It's an aluminum body with decorated wooden slats that folds into a completely flat object so it can be hung on the wall as art when you're not using it as a chair. For someone like, oh, say, me who likes to keep spare folding chairs around for larger dinners and other social events, this solves the problem of storage and also gives my lowly folding chairs a touch of elegance. And these are probably prettier than some of my existing wall art...bonus! Those chairs are totally unique! The way they hang on the wall I would have never guessed that they were chairs. I think it will be very helpful to manage small space with this type of furniture !! Where can the Pick chair be purchased. I've searched the web and cannot find a seller.